I really do love my day job. I have the occassional opportunity to venture into interesting places that I am eager to share. The herbarium at Singapore Botanic Gardens is one of such places. It is tucked at a corner of the sprawling compound and may not be easily noticeable to common visitors. Part of the herbarium, particularly the preparation area is open for public viewing via a glass window in the library. 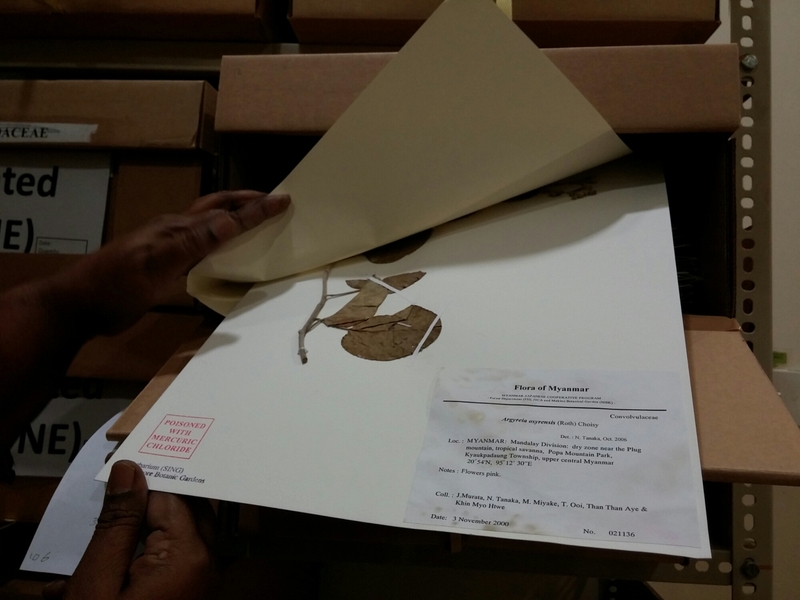 Through the window, you can observe how the experienced technician mounts the herabium plant specimen by applying glue and adhering it to a rag-cotton archival-quality card. The specimen is then sewed onto the sheet for additional support before the information label is pasted on. This step of preparation is only one of the several steps involved in the herabium specimen making process. Prior to mounting, other steps include collecting the plant specimen, preparing the sample using chemical treatment, preparing the information on the label and cataloguing the specimen in a database. 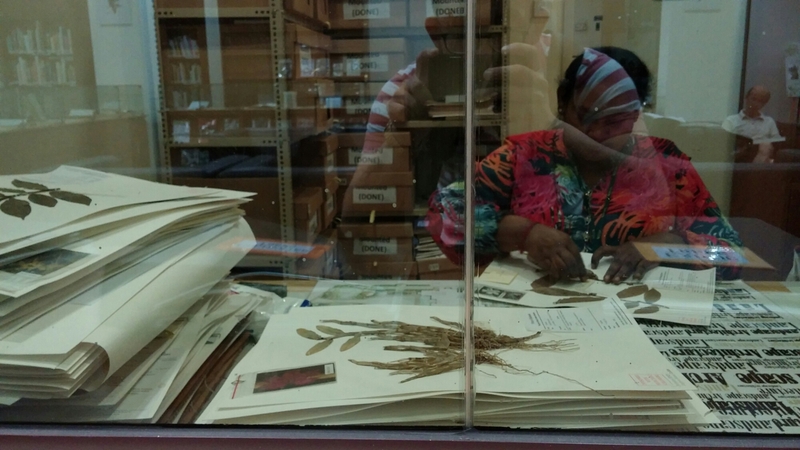 The widespread, scientific circulation of the herbarium specimen is precisely why it is so important to maintain a high level of accuracy and precision in each step of the preparation process. In a nutshell, a herabium specimen is a physical sample of a known plant classified according to the modern Angiosperm Phylogeny Group Plant Classification System. The specimen is usually collected during a fieldtrip or a floristic survey. About 30cm of the plant, representative of its growth, including leave, stem, flowers and fruit is collected intact. Each collected sample is accompanied by comprehensive field notes and desk research. 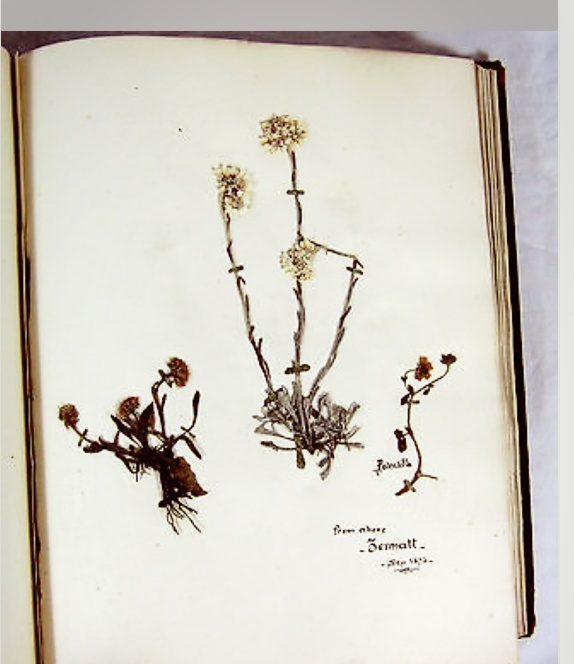 Information include the collector’s name, date of collection, collection number, locality, habitat and description of the plant habit, especially notes on field characters that cannot be observed on the dried specimen. Famous herbarium collectors who had graced the shores of Singapore include the great naturalist, Alfred Wallace, best known for his work on the theory of evolution through natural selection in 1858, paralleling the work of Charles Darwin. He conducted extensive fieldwork in Borneo and Malaysia, using Singapore as his research base. Wallace’s herbarium specimens now reside in UK collections, such as his fern collection in Cambridge University spanning 33 species, 22 genera and 17 families. More information can be found at http://cambridgeherbarium.org/collections/alfred-russel-wallace-ferns/. Another famous plant collector well known in Singapore is Henry Ridley, the first Scientific Director of Singapore Botanic Gardens from 1888 to 1911. He was known for the many years spent promoting rubber as a commercial product and his discovery in 1895 of a means of tapping which did not seriously damage the rubber trees. Due to his discovery and work, he was largely credited for establishing the rubber industry in Malaya and Singapore. Less well known, Ridley lived to a ripe old age of 100 and retired in Kew, where he continued to visit the Royal Botanic Gardens on a regular basis. 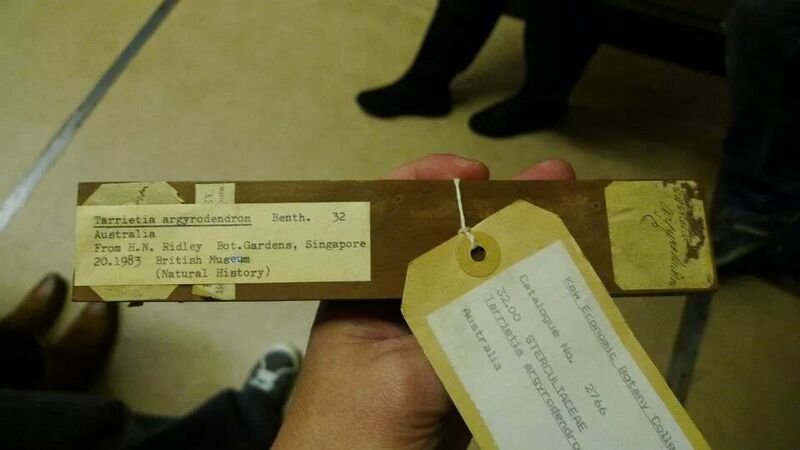 He also bought back many herbarium and timber samples now stored in Kew. The picture below shows one of such sample which I had the privilege to hold when I studied in Kew. 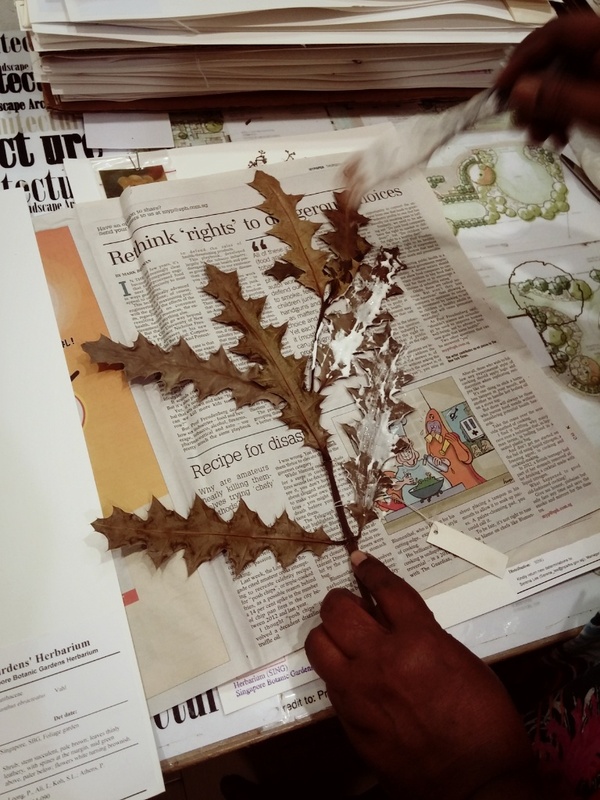 So how do herbarium samples relate to bookbinding? According to Duke University Herbarium (http://herbarium.duke.edu/about/what-is-a-herbarium), Luca Ghini, professor of medicine and botany at the University of Pisa during the 16th century, is credited with the invention of the herbarium. Traditionally, several plant specimens were glued in a decorative arrangement on a single sheet of paper. These sheets were then bound into volumes, stored in a library, and cited like books. Specimens were thus placed into a fixed order from which they could not be removed without destroying the specimens. It was the famous Swedish naturalist Carolus Linnaeus who advised readers of his Philosophia Botanica in 1751 to mount just one specimen per sheet and refrain from binding the sheets together. For storage of the mounted specimens, Linnaeus suggested a specially-built cabinet where individual sheets could easily be inserted at any place, removed at any time, and reinserted again anywhere in the collection. In contrast to the bound volumes of older herbaria, the order that Linnaeus’ herbarium cabinet brought to his collection was not fixed into perpetuity. 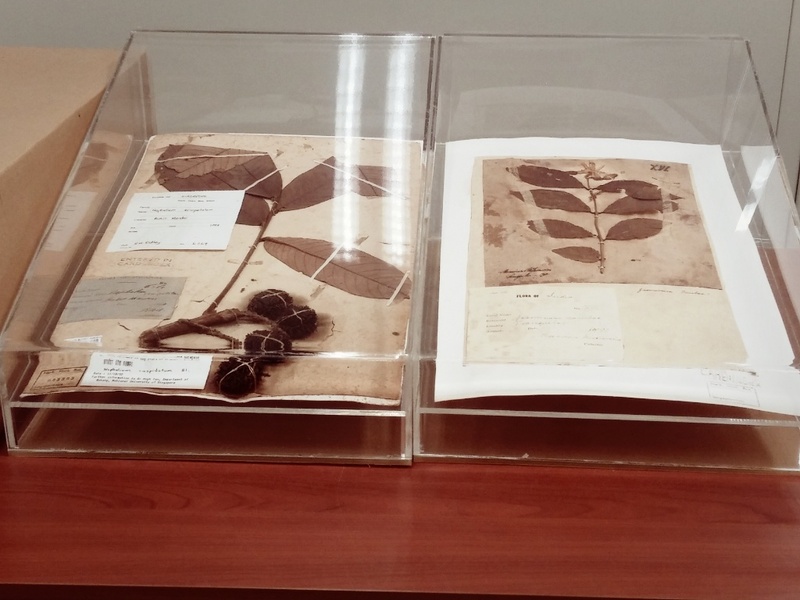 This “internal mobility” of the herbarium could accommodate the arrival of new material and enabled the user to repeatedly rearrange that material to reflect new knowledge. Hence, while not common, herabarium found as handbound volume do exist and are treasured. So, next time you stumble upon a volume of herbarium specimen, who knows, it might turn out to be quite valuable! Many people had asked me about making starch paste since all our bookbinding workshops use copious amounts of this wonderful natural, non-toxic glue . I have never treated starch paste making as a science, you know, like having fixed amount of water added to starch powder and how hot the temperature must be or how long to cool it, etc. Instead, it is mostly through trial and error, adding additional amounts of water on the fly and if the mixture did not turn out well, then start over again. But I thought it will be good to share how I normally do my glue and to explain briefly the science behind starch making. Starch is present in plants as a form of storage. It is a complex carbohydrates that has powerful thickening properties. When starch is combined with water or another liquid and heated, individual starch granules absorb the liquid and swell. This process, known as gelatinisation, is what causes the liquid to thicken. There are various types of starch, grinded into powder form available in Singapore. There is the common corn/maize starch, tapioca starch and yam starch. Notice most of these starch are either root based or cereal based, where these plant parts are used to store food for the plant. Gelatinisation occurs at different temperatures for different types of starch. As a general rule of thumb, root-based starches thicken at lower temperatures whereas cereal-based starches thicken at higher temperatures. 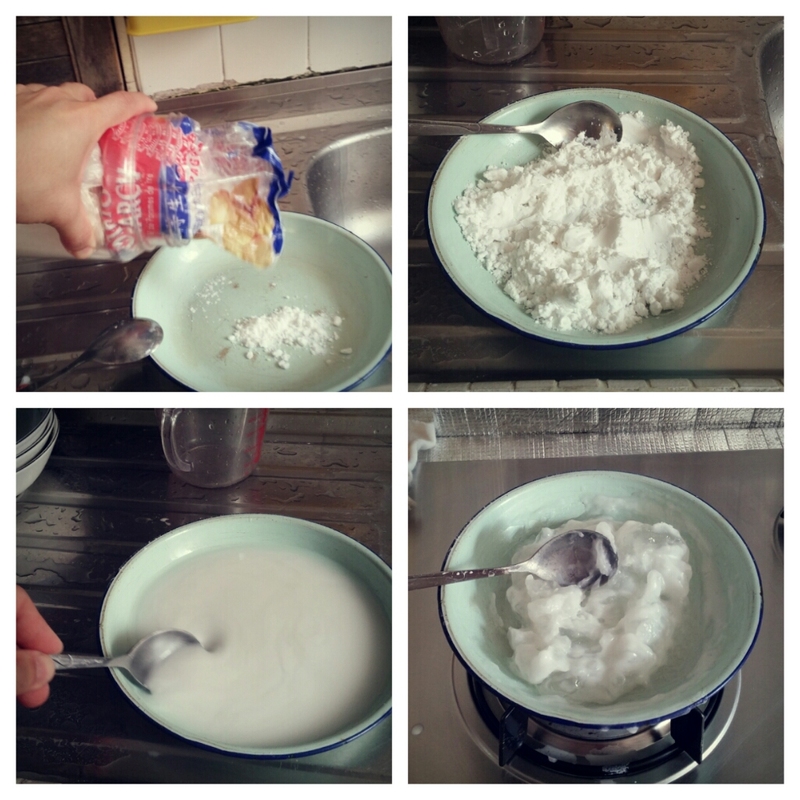 My preference is to use corn starch since it is cheap and readily available at all provision stores and supermarkets. I have a shallow enamel plate which I use for cooking starch paste. The plate is filled up evenly with starch to about half of its depth before water is added. As starch molecules will absorb water and clump together, it is important to keep stirring and to make sure no lumps are formed. Add enough water to form an even white mixture where you can see the starch powder suspended in the water. The mixture is then placed over a small flame, again with constant stirring to ensure even heating throughout. The shallow flat plate is good as the heat is spread out over a larger surface area instead of a container with a tapering small bottom that concentrates heating at the bottom. As you stir the heated mixture, you will encounter some resistance as the starch undergoes gelatinization, once a clear, gooey paste starts forming, off the fire but let the plate sit on the stove. Continue stirring as the rest of the mixture literally hardens as you stir. The finished paste should have the consistency of sticky red bean paste and a translucent colour. Once done, cool the paste in a glue container. I normally fill up to half the depth of the container so that I can add in white glue or PVA up to one third depth of the glue container. 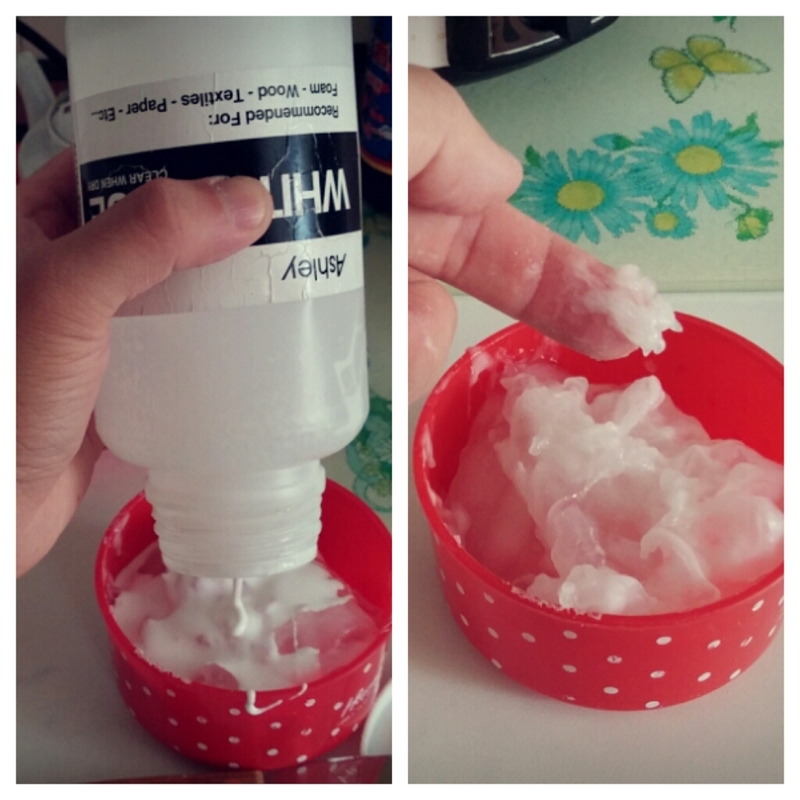 Stir the white glue/starch paste mixture well. The more liquid glue and the thicker paste should eventually form a mix that has the consistency of runny mayonnaise. The starch glue is the element that gives adherence between paper and boards without leaving unsightly glue stains from over application, whereas the white glue allows the mixture to dry more quickly. The starch glue can be stored and used for about 5 to 7 days before mould starts to set on the surface of the mixture. I do not refrigerate my mixture to keep it longer as it will harden very quickly. Hope the guide has been useful and keep trying! The past Chinese New Year must count as one of my most enriching and enjoyable. 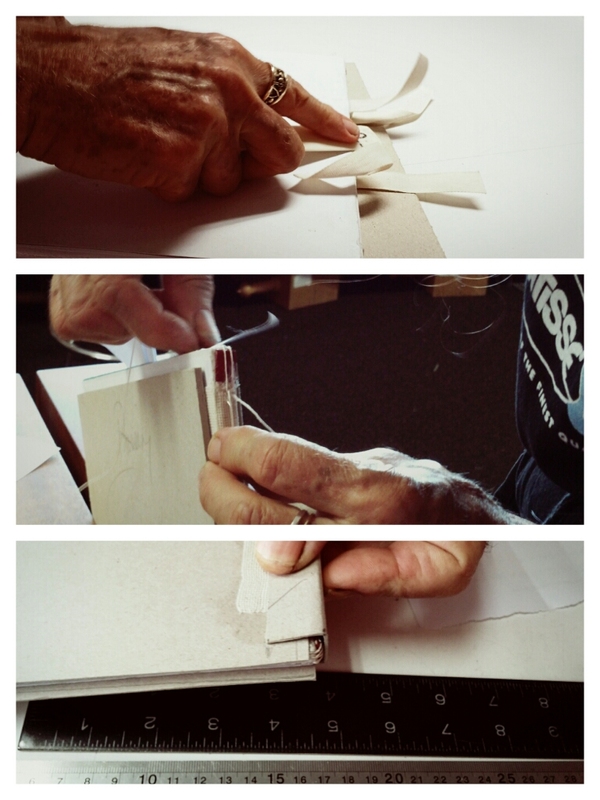 I had the privilege to spend three fulfilling days with Rosemarie and Terence of Sydney Bookbinding. 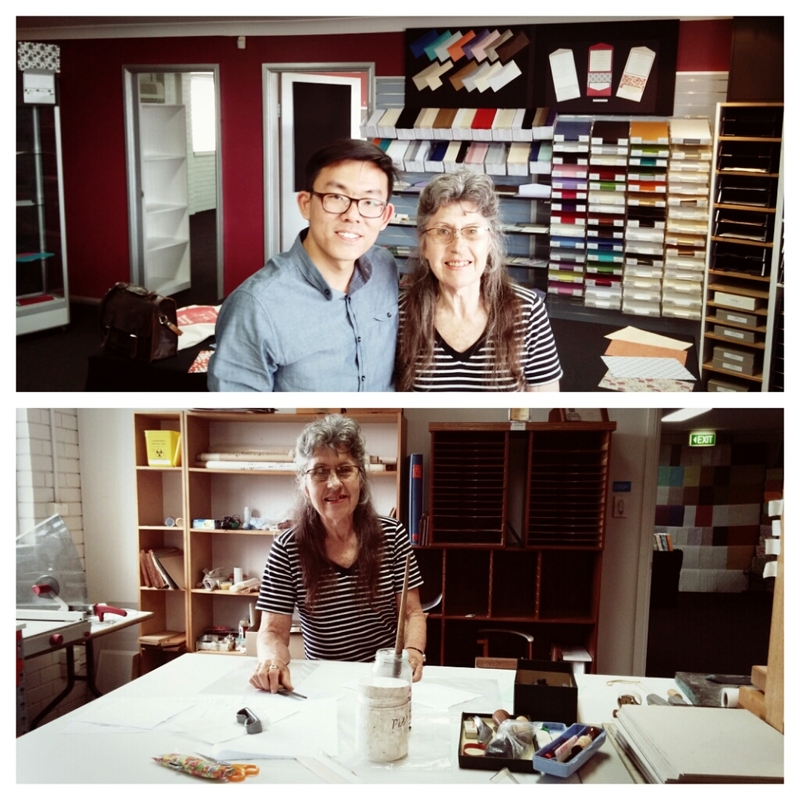 Rosemarie and her husband Kelvin are also owners of a specialty decorative paper and printing company, Amazing Papers. Combined, you get a quaint bindery nestled within a substantial showroom of decorative printed papers and Japanese chiryogami papers. Pure bliss for paper aficionados, I must say! Papers aside, the main purpose of the trip was to take bookbinding tuition from Rosemarie in order to brush up my skills. Of course, prior to the trip, I have looked up Rosemarie’s blog and realised she is teaching the Dos Rapporte book structure and that got me excited! The Dos Rapporte structure is designed by a UK based bookbinder, Benjamin Elbel. On his website, the structure is described as “a very special spine opening that allows for very flat opening” The name, in French which means “hooked on spine” also indicates that the spine, the covers and the book block are made seperately. 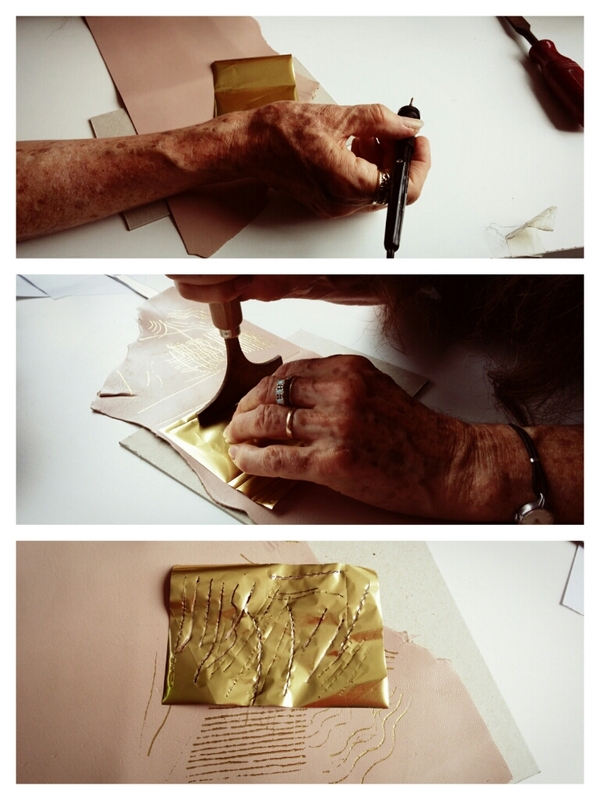 What makes Rosemarie’s take on Dos Rappporte structure special is how she had developed her own binding technique through a series of tests and trials together with her fellow bookbinder Terence. Rosemarie bought me through the process of building the book from scratch: sewing on tapes, rounding and finishing the book block, sewing on the headbands, measuring and making the spine piece and attaching the covers. The third day of my bookbinding tuition was spent on learning how to do gold tooling using hand tools and a heated stylus. Rosemarie demonstrated and shared her collection of hand tools, pallets and fillets with me. I had a most agonising time…not because the techniques were difficult but rather there were quite a few tools to play with and I was at a loss over what I should use for the session! Throughout the three days, Rosemarie had been very patient, meticulous in her teaching and most willing to share little gems of knowledge that will help me in future teaching. As a bonus, Terence also gave some pointers on selecting and sharpening my leather paring knives which are definitely invaluable! With my completed Dos Rapporte book, new bookbinding knowledge and a complete piece of Kangaroo hide bought from Rosemarie, I am definitely prepared for the new season of [A Bookbinding Cause] starting in less than two weeks (gasp! ).